We were finally able to shed our winter coats this weekend, yay! 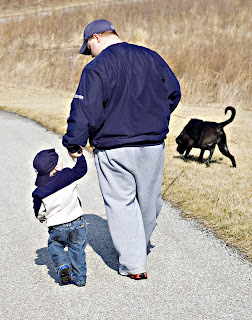 We took advantage on Saturday and went to the park. Zack was happy to have his new rain boots on so he could jump in the mud puddles. I can't believe the geese and ducks don't get hypothermia. 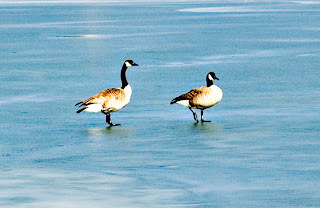 They were walking on the ice and swimming in the freezing water. YAY!!! Bring on the Spring! Love the rainboots. 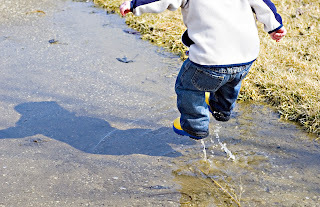 I LOVE those mud puddle pictures. 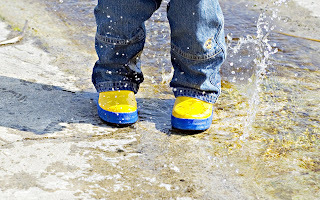 I told Trevor that we needed to buy Teagun some rain boots just for picture taking purposes. I doubt Teagun would do that though b/c he doesn't like to be dirty! He is having too much fun in the mud puddles. Devin would love that! I love those Dad & son pictures too!